Photograph of songwriter Irving Berlin, wearing his U.S. Army uniform, standing against a wall next to a poster advertising the only civilian performance of Berlin’s traveling U.S. military play This Is The Army at the Teatro Reale dell’Opera in Rome, Italy, in June 1944. The play was in Rome performing for U.S. military personnel during an international tour in World War II (June 1944) [Photograph by: Zinn Arthur]. The State Archives of North Carolina’s Military Collection is excited to announce the availability online of 416 original photographs documenting the international tour of American songwriter Irving Berlin’s traveling U.S. Army play This Is The Army was performed from October 1943 through October 1945 during World War II. Developed from the 1942 Broadway musical play and the 1943 Hollywood film of the same name, This Is The Army (abbreviated by the cast and crew as “TITA”) was initially designed to raise money for the war effort in the United States, and featured one of the most famous wartime songs of the 1940s “This Is The Army, Mister Jones.” TITA became the biggest and best-known morale-boosting show of World War II in the U.S.
Beginning in October 1943, TITA left the U.S. for England, where it remained through February 1944. From there, they traveled to North Africa, Italy, Egypt, Iran, India, Papua New Guinea, the Philippines, Guam, Mogmog Island, Okinawa, Iwo Jima, Hawaii, and numerous other locations in the Pacific Theater. The play traveled with makeshift stages that they set up on numerous locations and U.S. military installations/camps. The play’s cast played to hundreds of thousands of U.S. service individuals, including women’s bases and camps such as the Women’s Army Corps (WAC) camps in the Pacific. They traveled by troop transport ships, rented cargo ships, and landing crafts. View of African-American dancer, soloist, and comedian James “Stumpy” Cross introducing the song “Shoo Shoo Baby” during a performance by cast members of Irving Berlin’s traveling U.S. military play This Is The Army the hospital at Camp Huckstep in Cairo, Egypt, in August 1944. Part of the play’s “jam band” is pictured playing in the background. Photograph taken while the cast was stationed at Camp Huckstep to perform for U.S. military personnel in Cairo, Egypt, during an international tour (August 1944) [Photograph by: Zinn Arthur]. This Is The Army was the only full-integrated military unit in the U.S. Armed Forces during WWII, with African American men eating, performing, and traveling with their fellow white cast and crew members. Many of the men were not just performers before the war, but also recruited to perform in the cast from the U.S. Army ranks in 1943. The cast was all-male, which required the men to dress as women in drag for the women sketches in the play. In all, the play would prove to be the beginning of the eventual desegregation of the U.S. Armed Forces under President Harry S. Truman’s 1948 Executive Order 9981. This particular collection of photographs was mostly taken by singer and later celebrity photographer Zinn Arthur. Arthur would select and send these photographs to fellow cast member and singer Robert Summerlin of Tarboro, N.C. Both men would add identifications to the images over the years, resulting in the collection currently held at the State Archives. This collection of the This Is The Army photographs is the only known, publicly-available collection of these images in the United States. The complete set of photographs is available online in an album through the State Archives’ Flickr page. Original programs and tickets for the play are available for viewing in-house in the State Archives’ public Search Room. Photograph of singer Robert Summerlin from the cast of Irving Berlin’s traveling U.S. military play This Is The Army, standing in front of a lifeboat on the deck of the small freighter El Libertador, which carried the cast and crew of the play around the South Pacific in May 1945 during World War II. The ship was in Manila, the Philippines, when the photograph was taken. Photograph taken while the play was traveling throughout the South Pacific to perform for U.S. military personnel during their international tour [May 1945] [Photograph by: Zinn Arthur]. This entry was posted in Special Collections and tagged Flickr, Military Collection, military history, World War II on August 2, 2018 by Ashley. Veteran of Rockingham County, Levoir Lindsey, his wife, Viola, and daughter, Betty. From the Allen, Carter, Gwynn Family Papers and Albums (PC.2154). World War I – As part of the statewide World War I centennial commemoration, we’ve digitized many materials from our Military Collection related to North Carolina’s involvement, including letters, posters, photographs, and maps. Troop Returns – This collection is composed of troop returns from the Military Collection. Troop Returns (1747-1893) include lists, returns, records of prisoners, and records of draftees. The majority of this collection is related to the Revolutionary War. Allen, Carter, Gwynn Family Papers and Albums (PC.2154) – These papers, including several albums, were compiled by Joann Marie Davis, whose forebears lived in the 19th and 20th centuries primarily in Stoneville (Shiloh) and Mayo Township, Rockingham County. Arthur W. Matthews Jr. Papers (WWII 78, WWII Papers, Military Collection) – The Arthur W. Matthews Jr. Papers is composed of 68 photographs and a photocopied wartime diary, documenting the World War II military service of Arthur W. Matthews Jr. of Edgecombe and Wilson Counties, N.C., from April 1944 to February 1946. He served in Company A, 1258th Engineer Combat Battalion, U.S. Army, and later Headquarters Company, 376th Infantry Regiment. The majority of his service involved driving a truck in his unit as the 1258th Engineer Combat Battalion traveled through France, Belgium, and southern Germany, repairing or constructing bridges, constructing or clear mines from roads, building barracks to house displaced peoples in Germany, and guarding and transporting German POWs. Richard M. Hunt Papers (MMP 1, Miscellaneous Military Papers, Military Collection) – The Richard M. Hunt Papers documents the U.S. Marine Corps service of Colonel Richard M. Hunt, from his entrance into the Marine Corps in 1942 during World War II as a Lieutenant, through his retirement from the Marine Corps in 1969. Hunt served during the 1960s in the following non-combat military capacities: as the Assistant U.S. Naval Attaché at the American Embassy in Paris, France, from 1960 to October 1963; as the U.S. Marine Corps Congressional Liaison Officer in the Office of the Legislative Liaison from November 1963 to February 1966; and as the Military Aide to Vice-President Hubert H. Humphrey from 1967 to January 1969. Lawrence E. Allen Sr. Papers (CLDW 23, Cold War Papers, Military Collection) – The Lawrence E. Allen Sr. Papers is composed of photographs, military service records and certificate, postcards, military ID and membership cards, a partial U.S. Navy ship cruise book, and miscellaneous materials, documenting the U.S. Navy service of Lawrence E. Allen of Raleigh, N.C., from 1955 to 1958 on active duty, and to 1961 on reserve duty. This entry was posted in Digital Collections, News, Special Collections and tagged Flickr, Military Collection, North Carolina Digital Collections, Private Collections, Special Collections on November 9, 2017 by Ashley. The Charles A. Farrell Collection, PhC.9, is one of the most outstanding and well-loved photograph collections in the State Archives of North Carolina. As of today the entire collection of well over 3000 images is online via the State Archives Flickr site! Photograph taken near Duck, NC, Dare County, no date; estimated 1935-1940. Call number: PhC_9_2_85_37a. From the Charles A. Farrell Photo Collection, PhC.9, State Archives of North Carolina. The bulk of the photographs in the collection were taken by Charles A. Farrell between 1925 and 1940 in association with his work as a commercial photographer in Greensboro where he owned and operated the Art Shop for many years. Farrell also took a significant number of photographs of coastal North Carolina in the late 1930s. A brilliant and prolific photographer, Farrell photographed a variety of diverse subjects including traditional coastal life in Onslow County prior to the construction of Camp Lejeune, the Cherokee Indian Fair in the mountains of North Carolina, and aviation including pictures of Charles Lindbergh in Greensboro. The collection also contains older family photos and images captured by Farrell’s wife, Anne Farrell, a gifted photographer in her own right, during her travels in the state. Now all these photographs are available to the world via the Web. Please enjoy and let us know if you have any questions or comments. 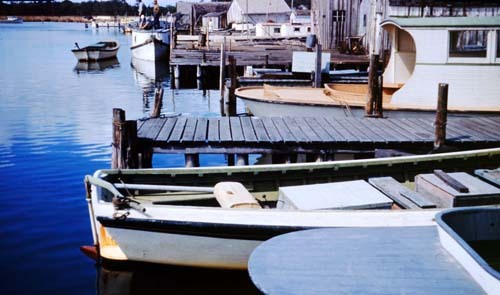 April 1941 – Manns Harbor in Dare County, boats on the Cashie River. Call number: PhC9_4_149_8. Photo by Anne Farrell. 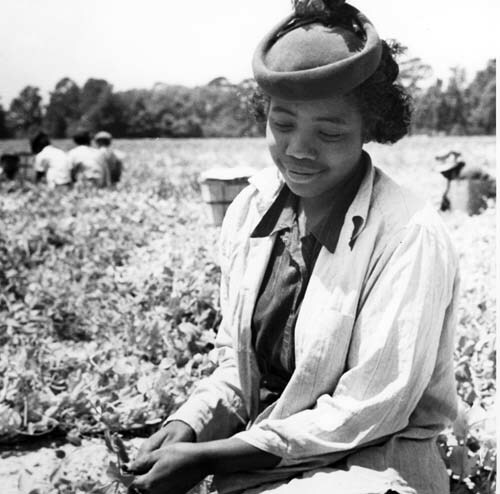 From the Charles A. Farrell Photo Collection, PhC.9, State Archives of North Carolina. This entry was posted in News, Special Collections and tagged audio visual materials, Flickr, Photographs, social media, Special Collections on July 7, 2015 by Ashley. William S. Powell, Professor Emeritus of History at the University of North Carolina at Chapel Hill, passed away on April 10, 2015, at the age of 95. After serving in World War II, the Johnston County native received his Master’s Degree in History from UNC Chapel Hill in 1947. Throughout his life, Powell wore many academic hats in addition to his professorship. He worked as a curator for the North Carolina Collection at UNC Chapel Hill, as the editor of History News, and as a researcher for the North Carolina Office of Archives and History. Powell’s academic career focused on the history of North Carolina. His works are considered seminal for fostering a thorough understanding of the Old North State. For example, The North Carolina Gazetteer is the definitive reference work for identifying all of North Carolina’s varied geographic locales, no matter how obscure. 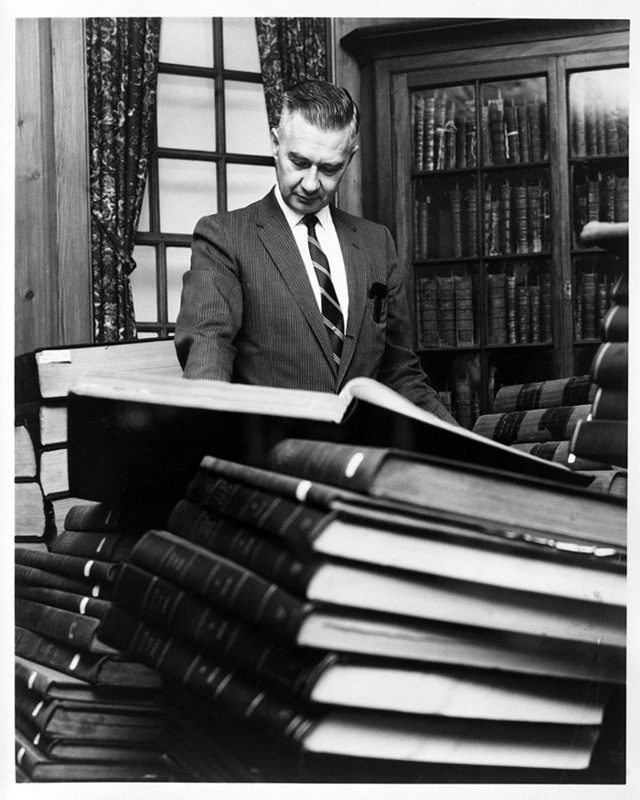 Powell’s contributions, both as an editor and an author, to the Encyclopedia of North Carolina and the Dictionary of North Carolina Biography are invaluable reference works for historians and genealogists alike. Powell was especially well-versed in the earliest years of North Carolina’s colonial past. He wrote a volume on the history of Albemarle County, contributed to the scholarship surrounding the Lost Colony, and helped authenticate the Carolina Charter of 1663 now in the possession of the State Archives. 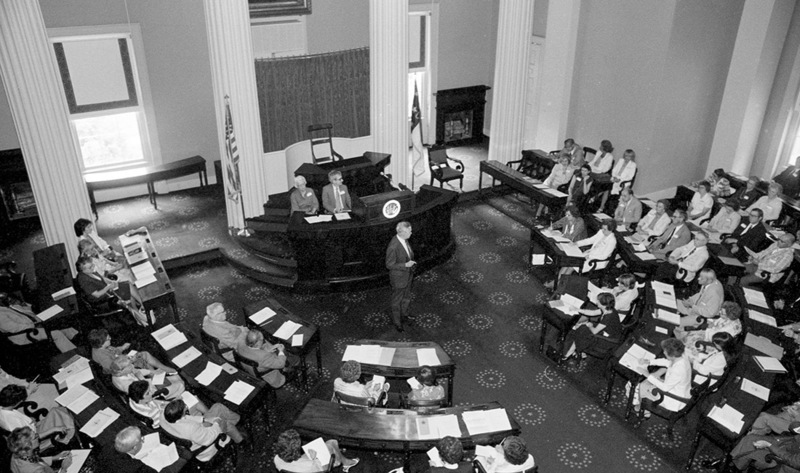 William S. Powell (Bill Powell) at the 400th Anniversary Celebration meeting in State Capitol, 25 May 1982. From the General Negative Collection, State Archives of North Carolina. Call number: N.84.3.395. Powell is a member of the North Carolina Literary Hall of Fame (2008), a recipient of the North Carolina Literature Award (2000), and a recipient of the Distinguished Service Award from Governor James Martin. This exhibit case is filled with the works which bear Powell’s name and demonstrate his commitment to the history of his native state. The State Archives of North Carolina commemorates his life, his legacy, and his contribution to the scholarship that occurs in this Search Room. This entry was posted in News and tagged Flickr, history, obituaries, Photographs, research, UNC-CH, William S. Powell on April 14, 2015 by Ashley. While the Outer Banks History Center in Manteo reaches thousands of onsite visitors who come to view gallery exhibits or conduct research in the reading room, the center has reached a new group of followers through its Flickr site. This photo of Kentucky Fried Chicken at Whalebone Junction was shared with the Flickr group Fried Chicken II. Charles d’Amours Collection, circa 1968. Images were first posted to the photo-sharing site in the autumn of 2009. Now over 500 photos in 21 defined “sets” populate the Outer Banks History Center Flickr site. We can now reach viewers in remote locations and highlight a wide variety of collections. Another advantage to having a sampling available online is that it allows staff to direct remote users to the site to aid in selection for photo ordering. At last check, over 40,000 views were registered. Many visitors to the Outer Banks History Center Flickr site enjoy leaving comments, especially about nostalgic summer beach vacations during their youth. This gives the site a convivial feel, as viewers comment back and forth and share memories. Links to History Center images have also been added to Flickr groups, like Vintage Texaco, World Islands and Fried Chicken II. This entry was posted in Outer Banks History Center and tagged Flickr, Outer Banks History Center, Photographs, social media on August 23, 2012 by Ashley.